A military helicopter crashed in southern Maryland on Monday afternoon. The Fort Belvoir UH-60 Helicopter crashed at about 1:50 p.m. in St. Mary’s County. 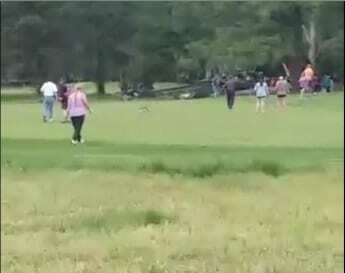 The chopper went down near the third hole at Breton Bay Golf Course in Leonardtown, Maryland. Two medevac helicopters were dispatched to the scene to aid with the rescue. The military helicopter took off from Fort Belvoir, Virginia with three people aboard. Maryland State Police were assisting with the medical evacuation following the crash. One person was killed in the crash and two others were injured.